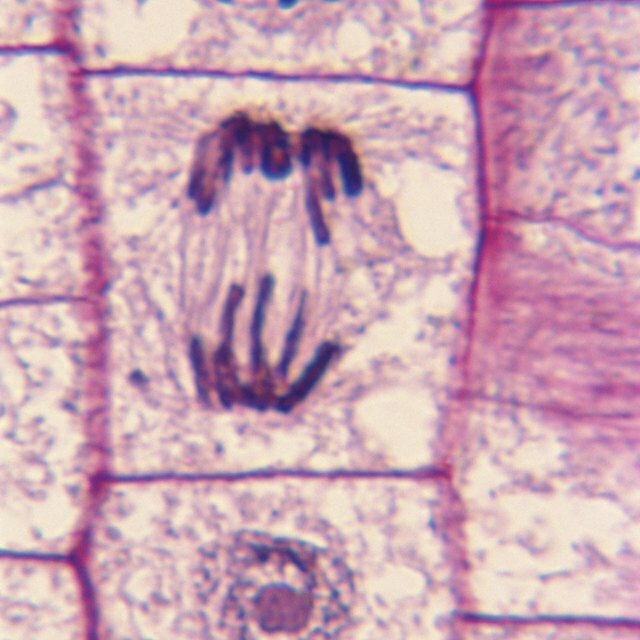 One general characteristic of living cells is that they divide. Before one cell can turn into two, the cell must make a copy of its DNA, or deoxyribonucleic acid, which contains its genetic information. Eukaryotic cells store DNA in chromosomes enclosed within the membranes of a cell nucleus. Without multiple replication origins, replication would take much longer and slow down cell growth. DNA is a long-chain molecule with a backbone of alternating sugar and phosphate groups. One of four nucleotide bases -- ring-shaped molecules containing nitrogen -- hangs off each sugar group. Two strands of DNA form a double helix structure in which the base at each sugar location binds to its complementary base on the sister strand. Only certain pairings are allowed, so if you identify a base on one strand, you know the base at the same position on the other strand. In eukaryotes, chromosomes are cylindrical structures of chromatin, which is a mixture of DNA and histone proteins. Human cells have 23 pairs of chromosomes, one pair member from each parent. A human chromosome contains about 150 million base pairs. The chromatin is tightly folded to compress the DNA so that it will fit into a cell. If you laid out end to end all the DNA in a human cell, it would measure about 6 feet. For replication to occur, the DNA helix must be uncoiled just prior to copying. Eukaryotic cells alternate between growth and division, and DNA is replicated during the growth phase. The DNA enters a relaxed state that permits access by DNA polymerase, the enzyme that copies each strand. Another enzyme, helicase, first separates the two stands in a region called a replication origin. Each strand serves as a template for a new strand with a complementary sequence of nucleotide bases. A replication bubble surrounding the polymerase molecule moves along each DNA strand during the copying operation. The old and new strands zip together at the rear of the bubble. DNA polymerase can transcribe eukaryotic chromosomes at a rate of about 50 base pairs per second. If the chromosome had but a single origin of replication, it would take about a month to copy one DNA helix. By using multiple origins, the cell can replicate a helix in about an hour, a 720-fold speedup. During the process, multiple replication bubbles on each chromosome churn out small lengths of DNA that are then spliced together to form the finished product. The advantage of multiple origins is that it allows relatively rapid cell division and organism growth. For example, a human mother would have to carry a fetus for 540 years before giving birth if she had to depend on a single origin of replication on each chromosome. Bank,, Eric. "The Advantage of Having Many Replication Origins in a Eukaryotic Chromosome." Sciencing, https://sciencing.com/advantage-having-many-replication-origins-eukaryotic-chromosome-16817.html. 25 April 2017.